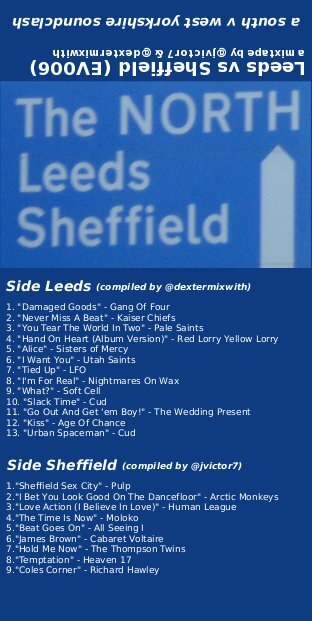 Ok so it’s taken a while since it’s initial inception but my partner in crime, @jvictor, and I have finally delivered the awesome Yorkshire soundclash that is “Leeds vs Sheffield”…. It’s part of the ongoing EpicMixTape project, that now has a splendid new blog – and several new releases, including @abeeken‘s superb All Rush Mix Tape and totally Rawk Reading Festival 2002 mix by @gecko84. This new one by us is an effort to spotlight some of the incredible music that has come out of these two great Northern cities. For my part, I took Leeds – sitting like a giant at the end of the M1 and having a former reputation for utter grim-ness, but in more recent times has become apparently incredibly trendy and affluent. These are, of course, both stereotypes, and I have to admit I’m actually no where near as familiar with Leeds as with Sheffield. So, when it came to music I was surprised how many acts came from there that I completely love – LFO, Age of Chance and Nightmares on Wax, I’d always thought of as Sheffield acts! Then there’s other seminal post-punk acts like Gang of Four – you can see where their influence is on more recent pop acts like Kaiser Chiefs. Of course I knew the mighty Cud band and Wedding Present from my Indie/student days. For lighter pop relief you have the likes of U-u-u-tah Saints and Soft Cell – and on the opposite end of the scale you have the doom-laiden Gothic Punk acts such as Sisters of Mercy and Red Lorry Yellow Lorry. So, quite a bit of variety. There’s also some other notables I had to leave out (due to space/time) – including The Mekons, The Three Johns and Chumbawumba. As with EV003 it is designed to go on a c90 cassette tape. Next project really will be EPIC – I’m hoping to do a three-parter called “My Electronic Life”… Stand By…. Another excellent mixtape – good work chaps! So many great bands I hadn’t realised came from Leeds/Sheffield – Age of Chance, LFO, The Thompson Twins – alongside some of the classic names like Human League, Soft Cell and Sisters of Mercy.